The Olin Ambassador Program is a way for students looking to study abroad to learn more about the available programs by being matched up with a student who has already been abroad. 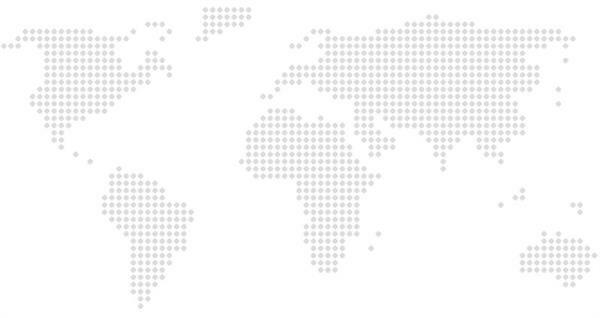 The ambassadors have studied in a diverse set of locations (Europe, Asia, and South America) and programs (traditional study abroad and internship). Below are our current ambassadors, feel free to reach out to any of them to learn more about their program and study abroad experiences. Ambassadors also serve as local guides for incoming exchange students, available to offer advice on adjusting to life in the US, St. Louis, and Washington University. 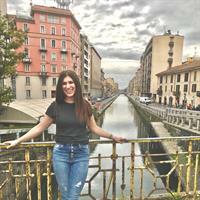 Ally Hirsh: I think connecting with other students who have studied abroad and hearing about their experiences is extremely valuable both when preparing to study abroad and throughout the semester. There are some things I felt I could have been more prepared for when I left for Milan and I would love to have those conversation with students to help them be more ready for the experience than I was. Advice to outgoing WashU students: Everyone grows so much during their study abroad experience, my advice would be to try to hold on to everything you've learned about the world and about yourself and apply that to your life back at school. Personally, study abroad made me much more outgoing and confident and I plan to hold on to that back at WashU. Advice to incoming exchange students: Prepare as best you can before hand to make your transition easier. I would recommend making sure you have a plan for things like you're housing, phone service before you arrive. Other than that, enjoy every moment! Say yes to opportunities and step outside your comfort zone. There is no better time to explore new things. Brooke Robinson: I've grown up traveling- in first grade my family moved to Barcelona for a year and ever since then I was hooked. Through my experiences of living abroad (Spain for a year, Paris summer after freshman year, and Milan last semester) I've been challenged, I've soaked up so much about other cultures, and I've had a great time learning about myself and growing. I want to be able to share my love of and appreciation for living abroad with other students. Advice to outgoing WashU students: Try to do something new, even if it is so small, everyday- there are so many cool and unique experiences abroad if you're really cognizant of all the new that is going on around you, it's very easy to take advantage of all the opportunities you have. Advice to incoming exchange students: Join any organization (academic clubs, greek life, etc.) and really get to know us Americans and American culture outside of the classroom. We're just as interested in learning about what your culture is like too! Regan Banvard: I want to be able to share not only my love for studying abroad, but also the realities that come along with it. Studying abroad was one of the most rewarding experiences in my college career. 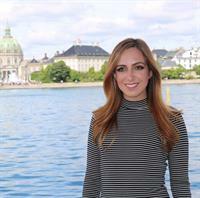 My experience at Copenhagen Business School’s summer program taught me how to balance studying and sight-seeing, provided me the opportunity to meet students from all over the world, and helped me become more confident and independent. Advice to outgoing WashU students: Don’t be afraid to be a bit selfish and independent—do things on your own! If you really want to do a certain activity or see a specific landmark, go do it! Who knows when you’ll have the opportunity again. For example, the first time I heard of Denmark was when I was reading Hamlet in AP Literature. When I was planning my trip to Copenhagen, I knew I wanted to visit Elsinore and send pictures to my AP Literature teacher. However, when I mentioned it to my friends on my program, none of them seemed interested in traveling two hours to go see the famous Kronborg Castle. It was my last week in Copenhagen and I still hadn’t seen the castle, so, I booked a bus ticket and spent the entire day in Elsinore by myself. I used to be the type of person who needed to be with others to go do fun activities, but being abroad taught me that doing things by yourself is rewarding and it teaches you to become more independent. Advice to incoming exchange students: Try to get outside of the WashU bubble (or even the St. Louis bubble) if you can! This can be a challenging thing even for WashU students, but it is probably one of the most fun things I have done with my friends. One of my favorite things about studying abroad was being able to explore new restaurants and new cities in Europe that I may not have otherwise visited if I wasn't studying in Scandinavia. I encourage you to try different brunch places in Clayton or even plan a weekend trip to The Ozarks or even Chicago! Oh, and you definitely have to try some Ted Drewes while you are here! Advice to outgoing WashU students: Spend more time in the place you're studying in than travelling. Travelling can be done again but living in a foreign city without a full time job and few responsibilities will likely never happen again. Advice to incoming exchange students: Meet as many American students as possible and get involved on campus. Danni Yang: In my opinion, the Paris Internship program is so much less known than the London and Israel Internship programs offered. I know that when I was considering applying to this program, the last participant from WashU was a student who had graduated around 4-5 years ago at least. I would love to be a part of bringing greater awareness of this opportunity to Olin students, especially since working abroad has helped me develop so much both professionally and personally and Paris is a great city to live in for half a year. Also, throughout the program I grew very close to the IFE team and they were such a great support system throughout the whole experience -- they run a very well-established and culturally/professionally enriching program in Paris. Advice to outgoing WashU students: Be very open-minded and willing to learn/adapt! You are now the foreigner coming into a culture where things will be very different from what you're used to. Cultural faux-pas are inevitable, but people will understand that you are still learning -- respect is universal. Advice to incoming exchange students: If you came with other people from your university, make an effort to talk to local students and go outside of your social comfort zone. The worst that can happen is that you walk away with an awkward experience, but on the other end of things you make a WashU connection who will show you around campus and potentially become a very close friend. 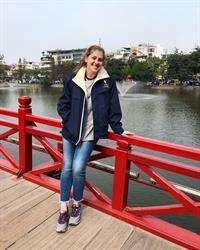 Abby Bishop: I would love the chance to help make life easier for any incoming students and have the chance to share my knowledge and experiences with the next group of outgoing UST exchange students especially about the day to day workings of Hong Kong, such as getting a phone plan and Octopus card. I know these basic necessities were a cause of stress at the beginning of my semester since I didn't have much information about how to go about getting set-up in Hong Kong, and I would like to help get the next round of students as comfortable as possible before their semester abroad. Advice to outgoing WashU students: Definitely travel and go see all of the amazing countries and experience the different cultures in Asia, but make sure to spend enough time in Hong Kong to really understand how the city works and see all that it has to offer. There are so many fun and unique activities and areas to visit around the city that you can get a full abroad experience without having to travel every weekend. It's also incredibly rewarding to feel like a local at the end of the semester if you spend enough time in the city to get to know it well. Advice to incoming exchange students: Don't be afraid to reach out to local WashU students and get involved with clubs and groups on campus. There are so many things to do around campus and some even specialize around Asian cultures and students, so there are definitely great options to get involved but still have a more familiar community within all of WashU. Also, make an effort to expand your network beyond the people you know from your home university and become friends with a few local students who can show you all of the cool things to do around St. Louis. It's incredibly rewarding to make friendships that span the world and it's a cool way to see how cultures can differ in many small day-to-day activities. Katie Zara: I really enjoyed my program and had some amazing unique experiences that aren't available in some of the more popular Olin programs. I'd love to share with people why I had such a great time in Singapore. Advice to outgoing WashU students: When you're abroad, it's great to take advantage of cheap airfare and travel to nearby countries on weekends and school breaks. But don't travel so much that you prevent yourself from establishing some sort of routine in your study abroad city. The benefit of a full semester abroad is feeling like you actually live in the country you are studying in, and traveling every weekend can get in the way of that. Advice to incoming exchange students: You may have to make an effort to meet local students but it's worth it and the local students will be happy to show you around or take you out to eat at a local St. Louis favorite. Once I started getting meals with Singaporeans I learned so much more about the culture from the perspective of a college student.